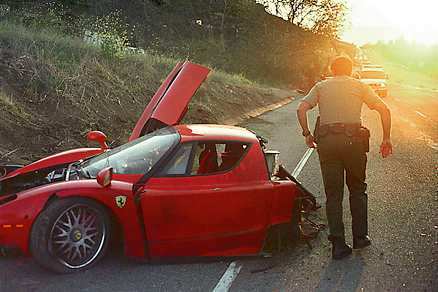 A Ferrari owned by Stefan Eriksson, a reputed member of the "Uppsala Mafia" (that's in Sweden) crashed last week on the Pacific Coast Highway near Malibu, California. The owner, who denies being the driver but did claim to be with a little-known arm of the Department of Homeland Security, tried to flee into the hills following the crash. Police are currently attempting to match his DNA to blood found on the driver's side airbag. Eriksson's mafia handle back in Sweden is "Tjock-Steffe," or "Fat Steven." Penalty for driving a rare Ferrari an estimated 162 mph while intoxicated? $1.2 million, the value of the car (see picture! ), as well as a few spots of trouble with a Scottish bank that may have a lien on the vehicle and possible extradition to face racketeering charges. Compared to which, you're going to have a good day today! Check out the home of Stefan Erikkson! It's at 2323 Worthing Lane, Los Angeles in the gated Bel Air Crest community.